I am way behind but here the photo of the giveaway. 2) leave a comment HERE. 3) participate in Graphicat Sketches #16 challenge. Hope the start to your week is going great! Monday's are always exciting when the week starts with a winner, a challenge and giveaway. Graphicat Sketches has another fantastic sketch for you this week. Pairing a sentiment from Graphicat Designs with the Witchkeys image from Saturated Canary, I created this Halloween card. Halloween is my favorite holiday and I am so excited that it's almost here! 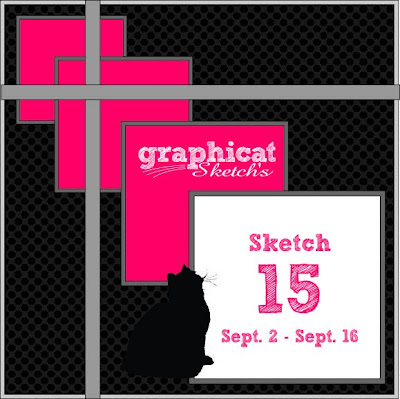 I hope you are able to join us this time at Graphicat Sketches Challenge #16. 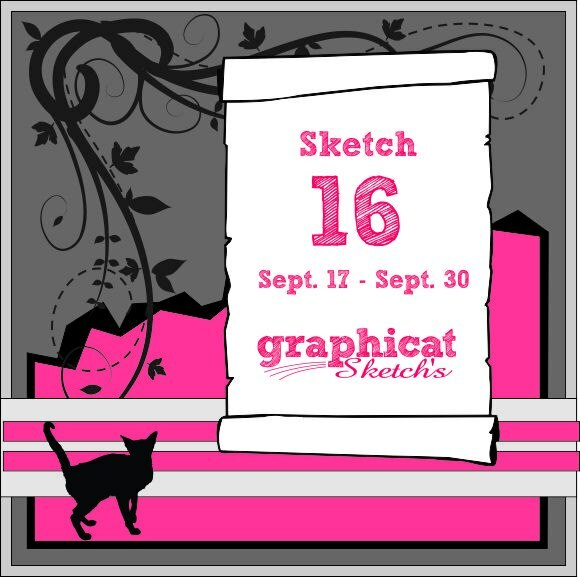 Congratulations to Sketch #15 winner!! Also, if you do decide to play along and you are a follower of my blog, I'll put your name in a hat to draw for some goodies (picture will be posted by Wednesday). Just make sure you link up your card at Graphicat Sketches by the deadline and leave a comment below. A few years ago the kids went to the zoo with their Grammy, aunts and cousins. I am way behind on getting some of their outings scrapped and in albums, this particular outing happen in 2009. My girl and boy with one of their cousins taking a break at the zoo. Such love in one little photo. 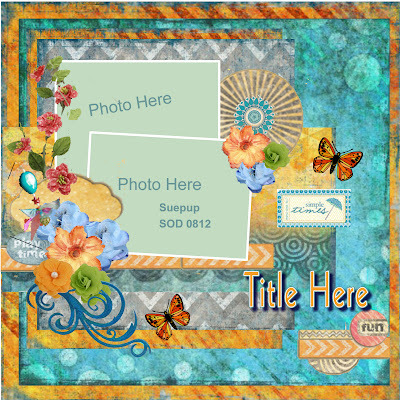 Using the August kit - Jamaican Sunset, from Scraps Of Darkness, I created this layout using a beautiful sketch from Suepup, made exclusively for the Jamaican Sunset kit. I love the beautiful colors and gorgeous add-ons. Here are a few more views of the layout. The bubble for the title are from Epiphany and what trouble they caused. Since they are supposed to adhere to the paper because of the adhesive backing, then I was proven wrong. I pushed, mashed, pressed with all my might and still those little suckers kept falling off. Finally I just glued them down. So far they are sticking and I do like the way the title turned out. Scraps of Darkness September kit will be release in the next few days. Visit HERE to see all the beautiful inspiration the design team creates with each kit. I know I'm late but I wanted to get this one up. 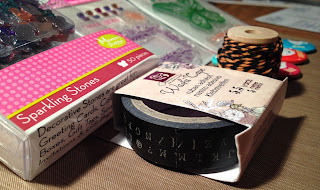 August tag from Tim Holtz 12 Tags of 2012. I had problems with this one from the start. For some reason the embossing just didn't want to work for me. 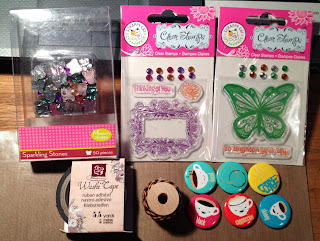 I don't had a lot of Tim Holtz products, So I improvised with the flowers, stems and leaves. The flowers were created with My Creative Time Rolled Flower Dies and the leaves and stem were created with Sizzix Flowers, Branch, leaves set. The tag is not too bad but I had hoped for it to be a little better, I really liked the design. Here is a closer look at the flowers. I can not wait to try September's tag. Addiction - Obsession...What's the difference? Today I want to clear the air, just get it out there that I am an addict. 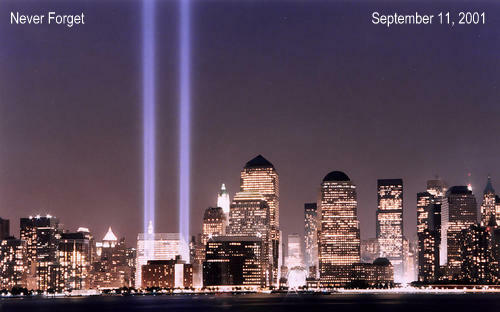 I can't remember when it started but I do now when and how it escalated. I have always loved it but I truly fell in love about four years ago. I was wrapping up my first semester in college and finals loomed over my head. My kids were sick with the flu and hubby was helping as much as he could with two sick kids who only wanted their momma. Finally once night after the kiddos settled down and fell asleep, realized how tired I was but knew the evening was just beginning for me. So I brewed my first midnight pot. Then the days turned to weeks and the studying didn't stop at home. There were occasions when I had to turn to the library for help and of course I couldn't brew in public. So I took to the coffee shops in desperation to fuel my brain cells with the energy I needed to study. But this only lead to a deeper addiction. And not just to my regular home brewed kind, but to STARBUCKS - my choice coffee shop. It doesn't matter the time of day! I LOVE IT! Regular brew, Mocha Latte, frappuccino blended, iced coffee and even tea: Chai Latte, passion, and green. In dedication of my Starbucks addiction, I decided to SMASH* two pages. Using My Creative Time stamps set: Coffee Break, You Are Perk-fect and Coffee Backgrounds - I created this tribute to my small addiction. 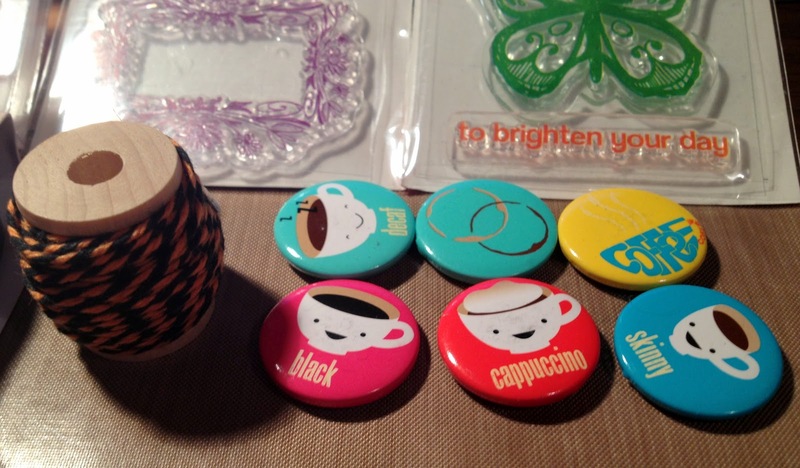 The little buttons are actually magnets I found at Target in the dollar bin. I also created a journaling pocket with the sleeve from Starbucks by stapling the bottom together. Or to hold whatever any other ephemera. Love the Polaroid from from KaiserCraft. The coffee cup stamps and die is from You Are Perk-fect stamp set. Thank you for letting me indulge in my little confession! Are you as addicted to Starbucks as I am? I admit that I have even contemplated employment opportunities just so I can get a discount. LOL - I need help, I know! Hope you are having a wonderful long weekend. Today is another fabulous Graphicat Sketches Monday. 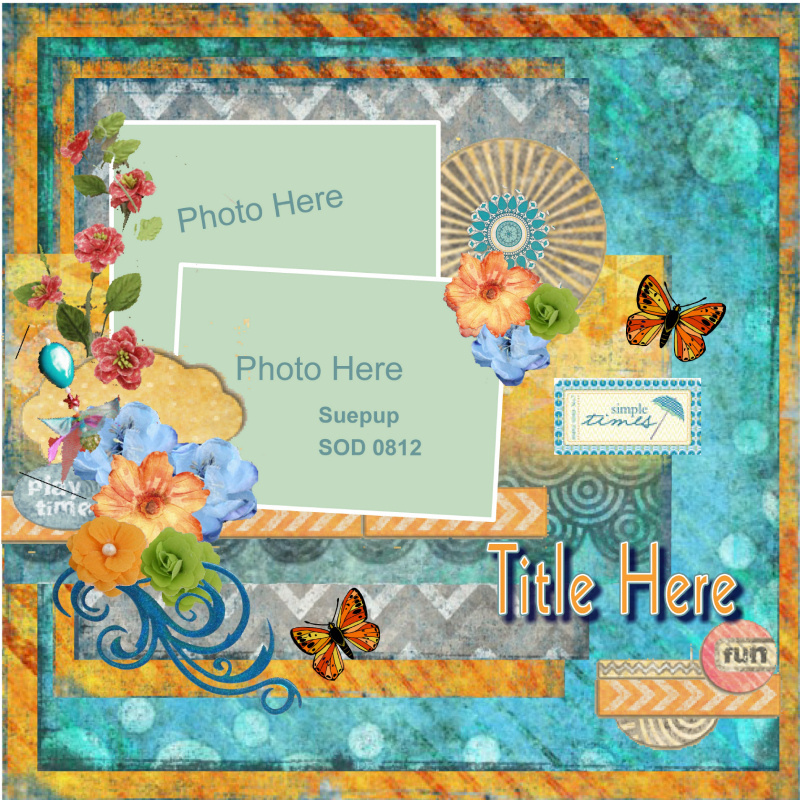 With sketch 15, I incorporated Peachy Keens Stamp July kit with a sentiment from Graphicat Stamps. I hope you are able to play along this week. 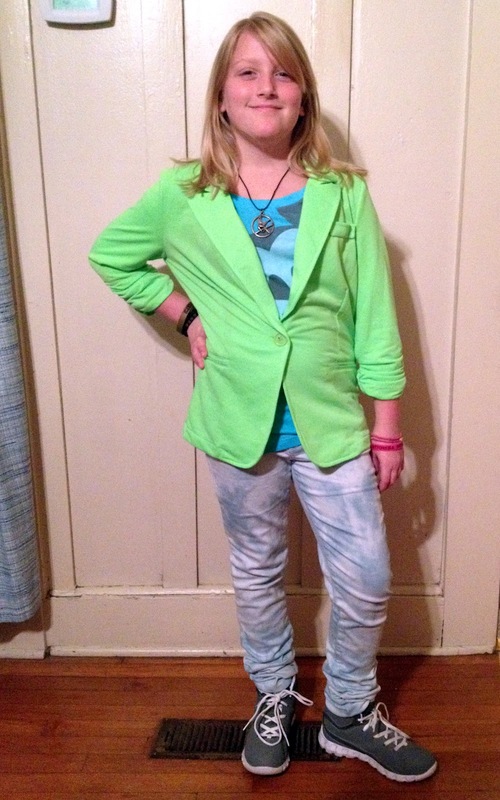 Happy 10th Birthday Baby Girl! 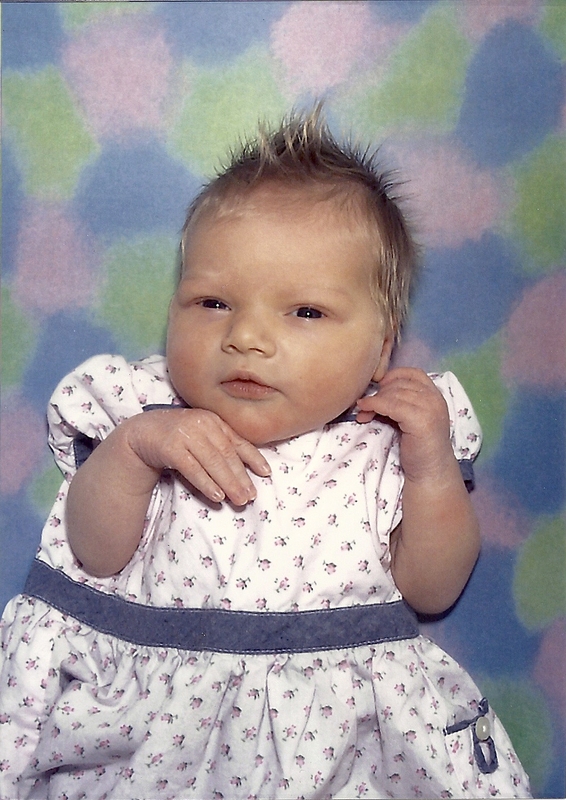 10 years ago today, my DH woke me up with the words - Happy Birthday! We had planned a day of relaxation and lunch at one of my favorite restaurants, Clear Springs Restaurant. Is was in the middle of lunch that I knew I would get to see you soon. That's when you decided, "Today is the day - you will bless this world with your presence." Baby Girl - one day. 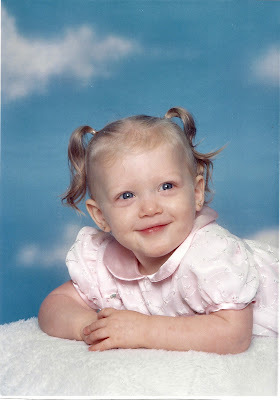 Baby Girl at the age of One. Love Momma, Daddy, and Brother!